One day I was at the grocery store and I was like, "Must. Have. Baby. Bok. Choy." I love baby bok choy and really cabbage in general. Then I got this flavor profile in my head that consisted of bok choy, vegetable broth and coconut milk. I wanted it in soup. There are worse pregnancy cravings, so I decided to follow my belly on this one and do some investigating...because making any sort of Asian soup outside of egg drop soup is something I have never attempted. What can I say, I guess pregnancy makes me adventurous. 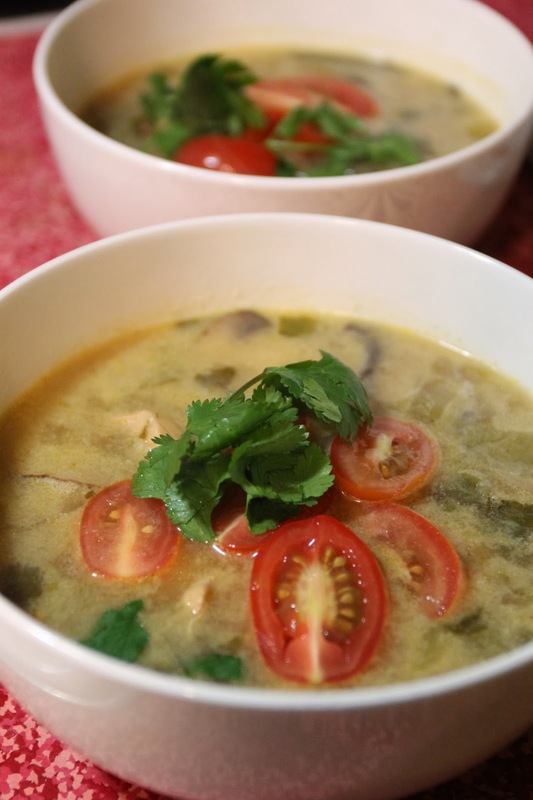 What I discovered was THIS RECIPE for a soup called Tom Kha Gai. I've never had it. I had never even heard of it, actually....but living in a small town with perhaps one Thai restaurant (if even that?! ), this is not surprising. What I have made here is an adaptation, and I hesitate to call it Tom Kha Gai because I'm sure it's not. I was soooo pleased with the way this recipe came out, I just HAD to share it. Even though there is nothing remotely Italian-American about it...but hey, stranger things have happened, I am sure. Thai inspired soup on an Italian-American slanted blog? Par for the course. If you are looking for a warm Asian, soupy hug this is the recipe for you. I will definitely be making this one again! Does this look like a lot of ingredients? Because it sort of felt like a lot...But whatever, I was trying something new and that made me hhhhaaaapppppyyyy. I started by cutting my chicken breast into thin strips. Okay, they could have been thinner, but this was where I landed. You can do what you want with your bad self. Either way, brown your chicken in a big old soup pot with some olive oil. And then, the veggies: jalapeños, onion, garlic, lemongrass and ginger. Honestly, I have never before cooked with lemongrass, and I'm not sure what in the heck it's deal is (anyone want to enlighten me on this lemongrass thing, please help a sister out!) but it stayed relatively hard. So I ate some of it (crunchy) and took some out (too crunchy). Next time I might buy the stuff in the tube...is that bad? Cilantro. Half a bunch. Chopped up and stuff. Throw those veggies in the pan with your browned chicken and then put your face over the pot and give it a good whiff. Smells like heaven. I let this cook down about 5 minutes. Add four cups of vegetable broth. I used my Better Than Bullion because that stuff is the bomb! And a can of coconut milk...light variety. Why light? I have no idea. It's just what I bought. It's a crazy world. The juice of five limes. If you use four limes or six limes, it'll probably be alright. Five was what my intuition told me to do, and I listened. Two tablespoons of fish sauce. Now, I know that the words "fish sauce" might sound somewhat unattractive to you, and if that's the case, I suggest you not smell it when you open it. Don't think, don't smell, just add it to your soup. I swear, this fish sauce is magic. It's something I have been buying for years because it adds GREAT flavor. Trust me. But don't smell it. And that dang baby bok choy! Ain't it purdy? Along with some mushrooms. I did one package of baby bellas, but you can get as sassy as you want with any variety of mushrooms. And at this point I had my soup bubbling away and smelling divine and what do you know, the power decided to go out! It was out for an hour, and then I resumed cooking so the timing may seem a little bit spotty....but I think if you cook it an hour, you'll be good to go. Garnish with fresh cherry tomatoes and more cilantro. Brown the sliced chicken in the olive oil over medium high heat. Add the onion, garlic, lemongrass, jalapeños, ginger, and half the cilantro. Allow it to cook for about 5 minutes. Add the coconut milk, vegetable broth, lime juice, fish sauce, and cayenne. Allow it to come to a boil and then add the mushrooms and bok choy. Reduce heat and simmer for 40 minutes to an hour. Taste to be sure you enjoy the levels of seasoning. Adjust if necessary. To serve, garnish with fresh cherry tomatoes (halved) and the rest of the fresh cilantro. Love it! I'm glad you tried something new and that turned out to be something Asian-inspired. Although it seems like a lot of ingredients, that's what I love about it... there are just so many fresh ingredients to use! And most of them are healthy! True story. All the freshness really shines through!!! Looks great! When I'm using lemongrass, I just cut off a good hunk (2 inches or so?) and whack it with the back of a knife to bruise it and get the juices flowing. Then, when I'm done cooking, I fish it out. Ah! So I wasn't totally off in removing some of it from the soup! It seemed to be bristly even after cooking, so I sort of wondered!!! Thanks!